1. In a series of items where using a comma may be confusing. For example: “This summer I visited Seattle, Washington; Los Angeles, California; and Chicago, Illinois.” This is the only way you’ll ever see me using a semicolon in my writing. 2. To join two complete sentences that are similar in thought or seem to go together. For example: “Let the cat outside; she is meowing.” I never use them this way because I prefer shorter sentences and I just see no point in joining them. A semicolon is a place where an author could have ended a sentence, but choose instead to continue it. You are the author. The sentence is your life. I’ve made it no secret that I have dealt with severe depression in the past. I have even attempted suicide. But through God’s grace alone, I am here. This is no longer a daily struggle for me, which is also thanks only to God, and to understanding how valuable I am and what my purpose in life is. But the struggle is very real to me. And it’s very real to many people. It’s not talked about enough, it’s not understood enough. But, if you’re struggling with depression, I know how you feel. You don’t feel happy, but it’s more than that. You feel hopeless and like happiness is some myth you once dreamed up. Maybe you once experienced it, but it was fleeting and it feels like something temporary. You feel like no one really understands. People think you’re just in a bad mood or didn’t get enough sleep or you’ll just get over it eventually. But you never seem to get over it and sleep is something you love, because you can truly escape the pain for a while. People are full of suggestions, which never seem helpful. But most of all, they think you’re exaggerating or being dramatic or lazy. There are people who understand. You feel like there is no point to anything—work, school, family, friends, hobbies. Why bother? Why do any of it? Nothing you do seems to be right or make a difference. Nothing ever goes like you wanted. You think sometimes that the world would be better if you were dead. You’ve probably even thought of different ways to end your life, or are seriously hoping that a bus will come by and do it for you. Because, you know, an accident is tragic, but suicide is selfish, right? No, it’s not. And your life isn’t pointless. You feel trapped. Therapy doesn’t work, medication doesn’t work. Nothing will ever make this better, nothing will take away this pain. You feel like there is only one way out. Death. It’s not. It will get better. I have felt all these things and for extended periods of time. I can tell you from experience, IT WILL GET BETTER! If you are going through this, there are people who understand, who can help you. There is no simple solution, no one thing that works for everyone, but there are ways to feel better. Talk to someone, get whatever help you can, even if it’s just having one best friend that will check on you and tell you they want you to stick around. Don’t give up. It will get better. So, my tattoo means a number of things to me. It’s a reminder of my struggle and that God alone brought me through it. It’s a reminder on the days I do feel down or when the random thought pops into my mind: “I could just end it and not have to deal with this,” that there is another option. I don’t have to end the story of my life. It can continue. Beyond that, it’s also a promise to my best friend. When I got my tattoo, she got one, too. She also struggles with depression. One time, after a period when I hadn’t heard from her for about a week, I finally got her to text me back and she told me that she’d been thinking of suicide. I freaked and asked, “Why didn’t you call me? !” Her answer: “I didn’t want to be saved.” And I get it, but I also cried. And I made a promise to myself to never let that many days go by without talking to her. You need a friend like this. Someone to encourage you on the bad days and someone you can encourage on their bad days. So, we got these tattoos together as a promise to each other that we would never make it a period. It’s also a fabulous conversation starter. People want to know why the heck I have a semicolon tattoo, and I love having the chance regularly to explain what it means, share a bit about my struggle, and talk about preventing suicide. I wish I could say I thought of this brilliant symbolism, but I did not. I first heard about this in April 2013, when The Semicolon Project had a one-day event for suicide awareness. 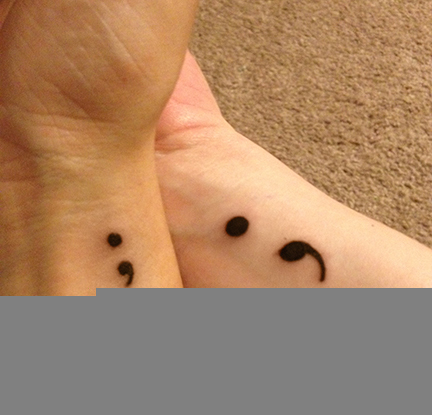 The next Semicolon Day will be September 10, 2014, on Worldwide Suicide Prevention Day. I’ll be posting on that day some of the things I do to feel better when things start going south. Great post. There’s just not enough awareness. Wow. I read a lot about anxiety and depression– mostly because I have struggles of my own and because I think mental health is just as important as physical health, even though people may not think of it that way. Of course, all that I read is moving and inspiring and thought-provoking, but I was particularly moved by your piece. I’m sharing it on all of my social media pages now! Thank you for being strong and courageous and for knowing your power, especially the power in your words and in your writing. I truly could not come up with a better reason to get a semicolon tattoo. It’s unique and it’s beautiful and perfectly personal. Melissa at These words are my own. Wow, thank you so much for this! And thank you for sharing. The more people that understand, the better hope we all have for getting help. I love your tattoo! What a great quote :) And you are so much more than what your genes are trying to tell you to be! Denise, that was such an amazing and heartfelt post. God is doing an amazing thing with you. He will touch others through you. You will be in my prayers as the world needs you in it and I pray that God blesses us with your life. Remember, you are never alone. He is with you, and he has given us to you also. Thank you so much, Mike! I’m not going anywhere :) He’s done amazing things already, and I can’t wait to see what else He has planned! Great post Denise. Very inspiring. I’m not much for tattoos, but I’ll wear one in spirit as well. Maybe I’ll make myself a wrist band full of them. 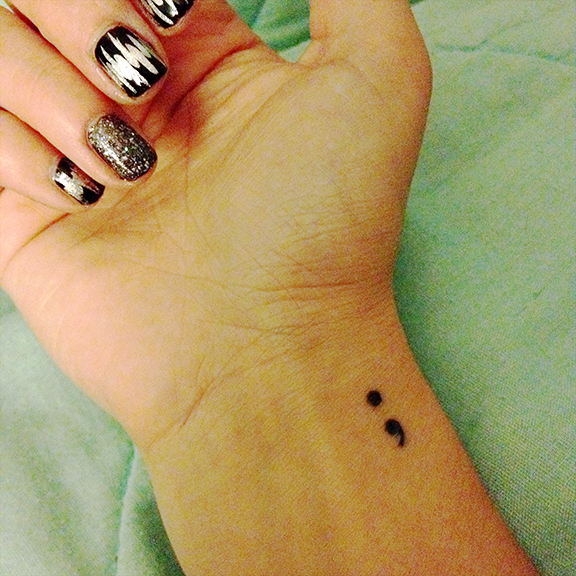 I really love that thought behind the semicolon…choosing to continue when one could have ended. Very thought provoking, thanks for sharing! Oh Michelle, you are the sweetest! I think of you every time I see my bottles of Emily de Molly! The first semicolon day, I painted it on my nails. :) Big hug back! Thank you Denise for those encouraging words. I suffer from major depression and anxiety. It seems as though there is no light at the end of the tunnel. Meds and therapy just don’t seem to help. I know that God can do miracles and this is my prayer. Thank you. I really needed to see this today. Depression has been at my back for over a few months and yes ended was a slight option. Really thank you for sharing this story. Thank you! I’m glad it helped and I’m glad you’re still here! Amazing post. I’d never heard of the semicolon project before but I can dig the vibe! As a near-victim myself many moons ago, I like the buddy-system you have with your friend. Great honest post. Glad you’re still here :) Thanks! Me too ;) Glad you’re here as well & VERY glad you’re writing. Nice style! Let’s make sure it was your last attempt! That’s a great verse. Do you have someone you can talk to when things get difficult? I’m seeing a counselor and a psychiatrist, both off which are amazing, and a huge support system. I’m doing well! Oh good. It’ so important to have people to talk to! Glad it’s going well for you. Hang in there!